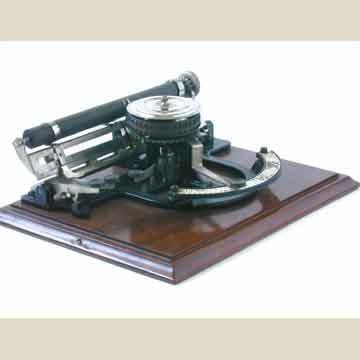 The People's typewriter was invented by Byron Brooks. 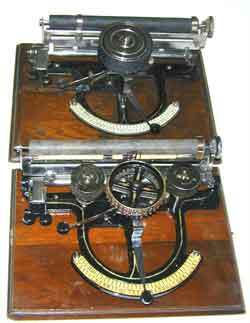 It is a simple index machine with a large typewheel. Character selection was done on the index card and printing was done with the key on the left that brought the platen forward against the typewheel. The most remarkable detail of the People's was its inking system. On the first version, inking was done through an ink roller that kept itself wet from an ink reservoir. The only other machine that such a concept was used on was the Sun 2 Standard, some time later. The reservoir on the People's didn't work very well though, and soon it was replaced with a system that was at least as peculiar. The pictures on the left show the cover over the typewheel of the machine. Over this cover a ribbon loop was placed that was attached between two metal rings. 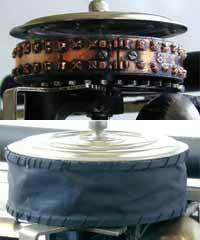 The top ring was held up over the cover, the bottom ring hun under the typewheel and kept some tension on the ribbon. The ribbon moved around a bit along the typewheel when the wheel was turned. This system didn't last long either and was soon replaced with a slightly improved model, the Champion, that worked with a regular ribbon between two spools. This one is even more rare today than the People's.